Imagine for a moment* that you have a dream. Imagine that you feel excited about that dream. Imagine that attaining/accomplishing/becoming your dream would make you happy and satisfied and excited, and that it would give life meaning. Clearly, living your dream would be a good way to live. So why haven’t you reached your dream yet? Why haven’t you accomplished it? I’m guessing you haven’t, because once you reach a dream, it becomes reality, and then it’s time for a new dream, unless your new dream is to continue enjoying the old one. Are you working toward it? If so, good for you! If not, why not? I’m guessing it’s not easy. Easy, small dreams get accomplished quickly and usually aren’t as rewarding as big ones which tend to be more challenging. I’m guessing there are barriers to reaching your dream. It costs money. Or it takes time. Or it requires courage. Or you lack confidence and hope. Or it just doesn’t seem reasonable. Or nobody gave you permission to go for it. Nobody told you to go live your dream. In case it helps, that’s what I’m telling you now. Go for it! Go get it/live it/be it! NOW! Today!! RIGHT NOW!!!!! Or at least get started and take the next step in its general direction. Get planning and get executing your plans. THAT is where the love of work comes in. Remember all those barriers? Well, love can conquer them. 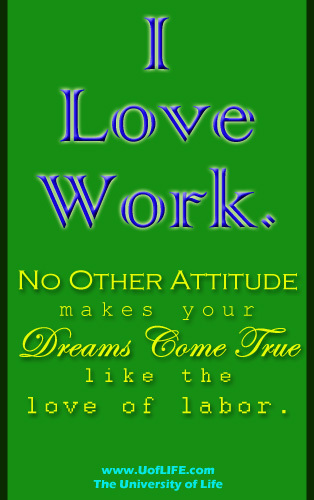 Love of your dream is a good start, but love of work is even better. After all, work means taking action. It means doing something. And when you do something, then something else happens as a result. When you do something about your dream, it gets you a few steps closer to the dream’s reality. Work is where the rubber meets the road. It’s the only way to make things change. It’s the difference between idle dreams and reality. And if you love it…then work becomes easy. Joyful. Exciting! Thrilling!!! You harness self motivation and that will carry you over all barriers. Work is the gateway to success. Loving your dream is easy. Loving the work that leads to your dream can be a little harder. Now let’s talk about the “other” kind of work. Hard work. Unpleasant work. Necessary tasks that stress you out just to think about. Maybe they make you tired. Maybe they take too much time. But if you have to do it anyway, then you may as well love it! Here’s how: find meaning in it. That’s what all the science is telling us these days, all the research. That if you find meaning in work, if you see its value, if you connect it to the big picture, then you’ll feel better about it and won’t mind it so much. Victor Frankel first pointed this out in Man’s Search for Meaning. He noted that survivors in WWII concentration camps were often those who helped others. By sharing their crust of bread, they lightened someone else’s burden and that supplied enough purpose and meaning to keep them alive. Work is not a four-letter word. Well, okay, technically it is a four-letter word, but it doesn’t have to be a bad one. It fits better in the “love” category of four-letter words. Work is life. Work, and the goals it turns into reality, give meaning to the passage of time. The Marketers have convinced many people that happiness comes from ease and consumption. Many people have grown up with such a bad attitude toward work that they have never experienced its joy! The very thought of effort induces so much stress, that they turn to their favorite escapes – video games, alcohol, sleep, and entertainment – and thus life passes them by and their lives amount to nothing. Okay, so you’re willing to believe that loving work is a good thing, but how can you get there? See the meaning and value in it, as mentioned above. Measure the progress that your effort brings to your goals. I used to mow lawns as a kid, and I calculated how much I earned with each pass of the lawn mower. 25 cents, 50, 75, a dollar…measuring progress helped make it less monotonous. Taking pride in your work can help. If you’re a waitress, then be a good one. Know that your customers leave the restaurant much better than when they came – because you delivered their food with a side order of cheer. They’ll even tip you more for it. If you’re a builder, know that even the hidden foundation and trusses are good quality because you built them right. Every time you drive past, your pride in a job well done will buoy your spirits. Make the connection between quality of work and character. First do good work, then observe what that says about who you are – someone who does good work – and enjoy the satisfaction of knowing it. Don’t overdo it. Don’t work too hard. Balance your life. Break large tasks into bite-size pieces that you can chew on for an hour or a day without choking. The end of the work day gives you a chance to experience the satisfaction of a job well done and take time for the many other beautiful opportunities that life offers. At the very least, simply decide to love your work and see what happens. Develop a new perspective. Discover that a good attitude makes your experience – your LIFE – that much more pleasant and rewarding. Repeat it over and over in your mind (“I love work. I love work. I love work.”) until it begins to make sense. Until you start to understand and believe it. Until you feel it and can hardly wait to get started! Continue until it comes true. Let all your efforts be a labor of love. Because when that happens, all your dreams can come true.